Demystifying STEM for families. National PTA will share proven practices for educating families about the ways they can support STEM learning, influence educational decision-making, and access STEM opportunities outside the classroom. Evaluating effectiveness of family engagement in STEM programs. 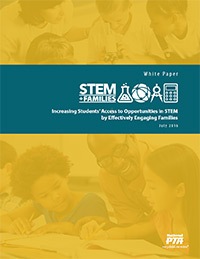 National PTA will develop a compendium of research, proven family engagement methods and share results from other organizations that have invested in evaluating family engagement in STEM. For example, read an executive summary and key findings from Bayer’s recent study of parents and science educators: 2015 Bayer Facts of Science Education Survey. Mobilizing communities to close gaps in underrepresented youth in STEM education and pursuing STEM careers. National PTA will support and promote local efforts to engage families in STEM education, as well as empower families to amplify their voices and work toward improving STEM learning in schools and community settings. Take the pledge to be a STEM + Families Champion and join the STEM + Families community of practice receiving alerts about new research, promising practices, grant opportunities, and updates from other organizations and companies committed to engaging families in STEM. Check back for more information on grant opportunities for your PTA.